A spacious four bedroom family home being one of only five in a small private close, in this semi-rural area with aspects to the rear over adjoining farmland. The property has a spacious and adaptable arrangement of accommodation with a triple aspect sitting room having open fireplace, large kitchen/dining room, two further reception rooms, utility and cloakroom on the ground floor. 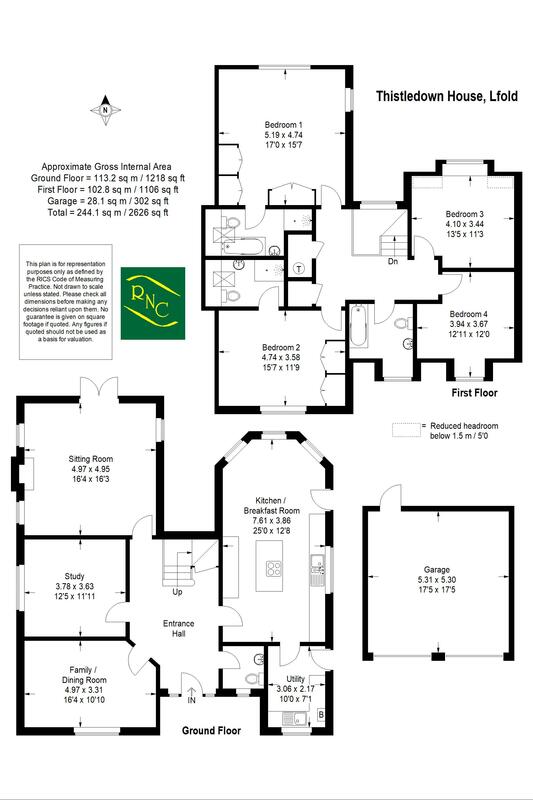 On the first floor there is a master bedroom suite with en-suite shower room, guest bedroom suite with en-suite shower room, two further double bedrooms and a family bathroom. Outside there is plenty of off parking leading to a detached double garage and access to a pleasantly landscaped rear garden with wide areas of lawn and adjoining flower and shrub borders and rockery. The rear garden enjoys open aspects over adjoining farmland. We highly recommend a visit to fully appreciate the accommodation on offer and the quiet location that the property benefits from. From our office turn left into the High Street and first right into Knowle Lane. After approximately two miles turn right into Wildwood Lane. At the junction with the A281 turn left and continue to the Alfold Crossways. Turn right and immediately left, signposted Alfold and Loxwood and continue on and through Loxwood village. On leaving the village turn right, signposted Ifold, and then first first into The Drive. Continue to the end of the road and Thistledown Vale can be found on the right hand side, as the road bears to the left. Continue down the driveway and Thistle House can be found straight ahead. Close coupled WC, pedestal wash hand basin, part tiled walls, tiled flooring, understairs cupboard. Triple aspect, attractive open fireplace with polished stone hearth and surround and mantle over, double casement doors to patio and garden. Front aspect, range of fitted furniture with space for television and storage under. A delightful room having a double aspect and views over the garden to the rear. Fitted with an extensive range of cream painted units under work surfaces with cupboards and drawers under, island unit with four ring ceramic hob with extractor hood over. Further range of units including dresser style display shelves. Integrated appliances including; dishwasher, double oven, under-counter fridge and freezer. Ceramic tiled floor, back door to garden, door to utility room. Fitted with range of units including cupboards and drawers under work surface, sink unit, space and plumbing for washing machine, LPG boiler for heating and hot water. Access to roof space, linen cupboard with hot water cylinder and immersion, built-in storage cupboard. Double aspect, range of fitted wardrobe cupboards. White suite comprising; panelled bath with mixer tap, close coupled WC, pedestal wash hand basin, separate shower enclosure with thermostatic shower, part tiled walls, tiled flooring. Comprising; double size shower enclosure with Triton thermostatic shower, close coupled WC, pedestal wash hand basin, part tiled walls and flooring. Fitted with white suite comprising; panelled bath with mixer tap and separate thermostatic shower over, close coupled WC, pedestal wash hand basin, part tiled walls, tiled flooring. The property property is approached via a driveway providing parking for several cars leading to a detached double garage. Side access to the rear garden which is a lovely feature of the property. Paved patio stepping onto good size areas of lawn with established flower and shrub borders around, ornamental fish pond with waterfall rockery. Up and over doors, one of which is electronically operated, loft storage area, power and light points.